SINDHUPALCHOWK, Dec 29: As the Melamchi Drinking Water Project progresses toward its final stage, it has achieved yet another breakthrough by completing the 8.2 kilometer Gyalthum-Ambathan tunnel section. This is the second of the three sections of the tunnels in the project. “With the opening of this tunnel, the Melamchi project is inching closer to completion,” executive director of the project, Ram Chandra Devkota told Republica. The official announcement of the completion of the Gyalthum-Ambathan section is will be made only on Saturday amid a formal function at the project site. According to Devkota, now only the Sindhu-Gyalthum section of the tunnel has to be constructed. In this section of 7.5 kilometer long tunnel section, only 500 meter remains to be excavated. The 9.4 kilometer Sundarijal-Sindhu section, which is the longest one, was opened during the end of last December. Project officials said they plan to complete the remaining tunnel excavation work in the next two months and complete the full tunnel structure in four months. Work in the ongoing Sindhu-Gyalthum section has been slowed as a hard rock has surfaced there, said Devkota. 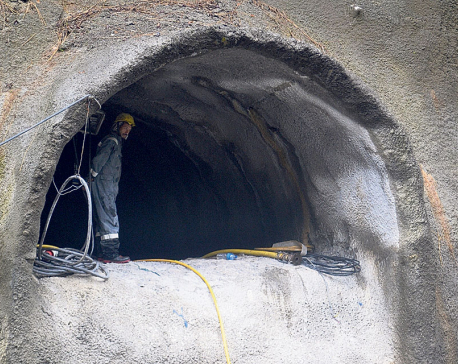 Now, around seven-meter long stretch of the tunnel is being excavated a day in this section. But the project plans to expedite the work and excavate at least nine meters a day. “We are going to concentrate all our resources and strengths to open the remaining portion of the tunnel,” said Devkota. The project which is being developed for the last 17 years will supply 1.7 million liters of water a day in the first phase to the capital city Kathmandu from the Melamchi River. A water treatment plant with a capacity of 85 million liter has already been built, with support from Japanese International Cooperation Agency (JICA), at Sundarijal. Another treatment center with the same capacity is being built. Meanwhile, the work of laying pipes for the water to be supplied from the Melamchi project is underway in the capital city since last year with major support from the Asian Development Bank. “The project will complete after we bring water from Melamchi to Sundarijal,” he said, “After that the task of supplying water to the people of the capital will be the responsibility of the distributor.” The government has a plan to distribute Melamchi water to Kathmanduites in next one year. The project was initiated in 2001 with a plan to complete it by 2007. The project officials claim that the project was delayed due to failure in finalizing the loan agreement with donors in time and due to compulsion of restructuring the project. The government has a long-term plan of supplying 510 million liters of water a day by converging water from Larke and Yangri rivers in the project. The project officials said the preliminary work of Larke and Yangri has been started under the sub-project-3. 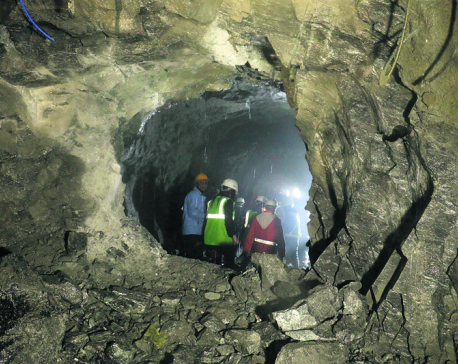 Photo: The source [opening] area of Ambathan tunnel of the Melamchi Drinking Water Project.